Camellias are really an easy care plant, if grown in the right conditions camellia care is easy. 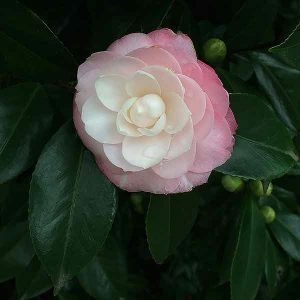 Choosing the right Camellia for the right position is a key step in growing great Camellias. If properly planted, Camellias can go for years with very little fertiliser or pruning and are fairly disease and pest free. The trick is to plant them in the right position, and in the right sort of soil. Before you even consider planting a camellia, prepare the soil. You are looking at a a well drained humus rich soil with a pH of around between 5.5 and 6.5, which is slightly acidic. This pH level allows for the best uptake of nutrients. Planting position is also important, all varieties perform best in a protected position. This means away from hot drying winds, and with protection from the hot afternoon sun. Basic Camellia Care when planting. Initial planting and Camellia Care after preparing the soil is as follows. Water the plant in the pot or container the day before planting. Dig the planting hole to a about twice the width of pot. Try to get the hole to the right depth, so the camellia will be sitting at the same depth in the soil as it was in the container. If you are going to use a stake, now is the time to put it in place. Carefully knock the camellia out of the pot taking care not to damage the root system. Gently tease out any massed 0r circling roots. Place the plant in the hole and backfill. Water regularly through the first few summers. Although Camellias are hardy plants they do perform better with a little regular fertiliser, you can reach for the commercial ‘specialist’ Camellia and Rhododendron fertiliser, or you can try something a little different. Camellias have a root system that is made up of masses of small feeder roots close to the surface. One of the issues with feeding or fertilising camellias is that these feeder roots can be easily damaged or ‘burnt’ by over application of some fertilisers. Masses of nitrogen can be a problem. One of the main signs that Camellias need a little extra care is yellowing leaves. This is often due to a lack of nitrogen and is called chlorosis. Caused by alkaline soils, heavy clay soil and or poor drainage this is best overcome at the time of planting. However as Camellias have fairly shallow root systems and gain a lot of nutrients from the top layers of soil remedial action can help. Before adding fertiliser it is advisable to prepare the soil around the plant first. You can cultivate the soil around the plant, the best place to do this is not near the trunk but out near the edge of the leaf canopy, or ‘dripline’. Simply lightly dig over the soil, not to deep as you do not want to disturb the root system. You will end up with a circle around the plant about 20cm wide. And this is where the fertiliser will go. Water this area well and then apply the fertiliser. Water in again and lightly mulch. You can do this just after flowering, and again in early summer. You may read about using canola seed meal, linseed meal, or even cottonseed meal. All do make good fertilisers, very slow release and work well. However most are not readily available as fertilisers in Australia.